We look forward to the first Saturday of every month, because its Bundoora Farmers’ Market day. The May market was a couple of weeks ago now, but I have a reason for writing about it so late. I needed to test out a few lovely products I picked up, BEFORE I wrote about them – and tonight I’ve finished. H (my daughter) and I headed off with our trolley, looking forward to bringing home a pile of fresh goodies, breakfasting on vegie dosas and Doctor Java’s soy hot chocolate. Fruit and vegies were on a pretty spectacular high – but I guess that’s what happens in autumn. We picked up bags of pears, apples, feijoas, tomatoes, grapes, corn, avocado, potatoes…you get the idea. We also got some of the moreish pesto almonds (no cheese in this pesto) from the nut man. Of course, the large container was totally finished by Sunday night. Once you start, you just can’t stop! Anyway, almonds have lot of calcium, so I don’t feel guilty. As we were heading out, satisfied that we’d bought or sampled everything we could eat, I paused to put my cup in the bin. When I looked around, H had disappeared. It didn’t take me long to find her excitedly checking out a stall we hadn’t noticed on our way in. She’d noticed it because the sandwich board at the front included that magic word ‘VEGAN’. There were samples! We elbowed our way to the front. For me, ‘simmer sauces’ normally conjures up images of Chicken Tonight – but these African and Mexican simmer sauces are the real deal. Authentic sauces, with real ingredients, mixed together and sold in quantities small enough for a meal. Juanita’s Kitchen is the Mexican range of sauces. From the Juanita’s Kitchen range, we chose the Mexican Mole. I once made my own mole, but ended up with such a huge quantity, we got very sick of it and just couldn’t finish it all. This small jar tasted remarkably similar to mine (which I was very pleased about), but was a much more manageable and less expensive option. 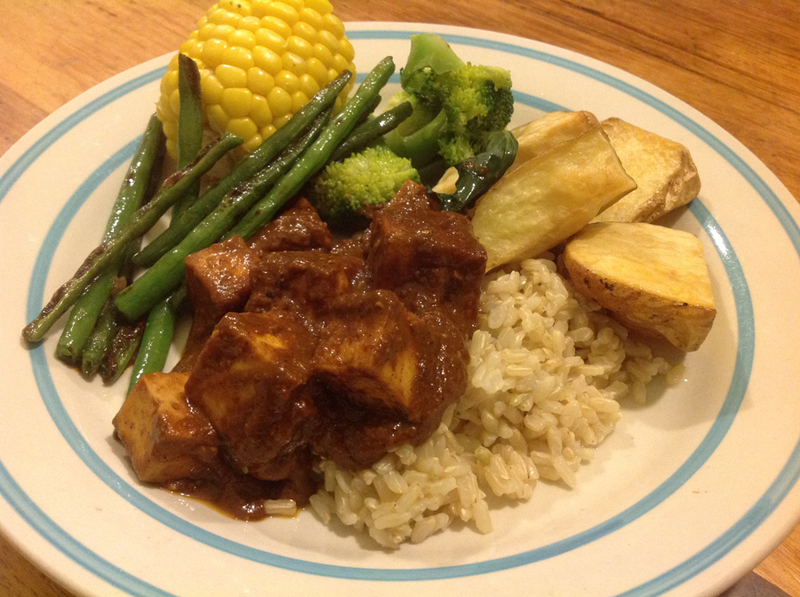 I cooked it with cubed, firm tofu, along with brown rice and vegies. It was delicious and rich and spicy. The taste is so striking, I wouldn’t want to eat it too often, but I think it will become a once-a-month special dinner for us. 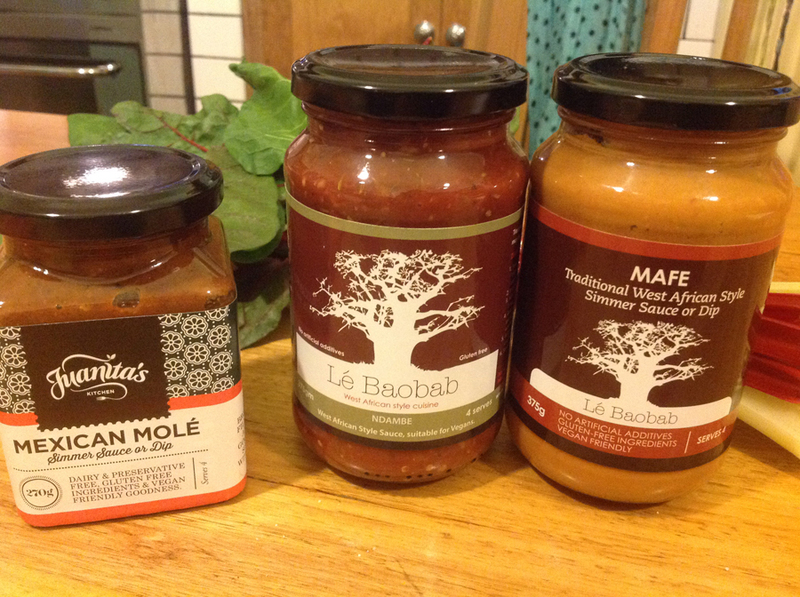 Le Baobab is the West African range of sauces. We chose Ndambe and Mafe. 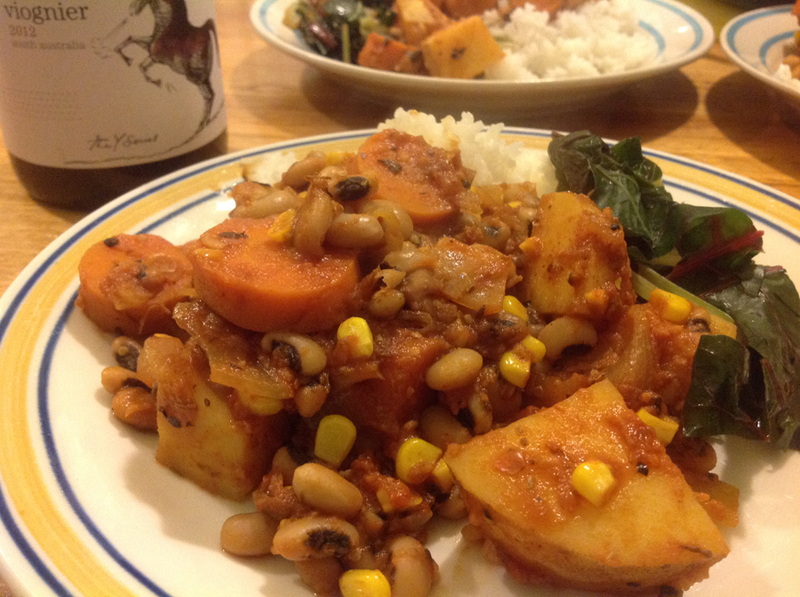 I followed the sample recipe that paired the sauce with black-eyed beans, corn, carrots and potatoes. I served it with long-grain white rice and sauteed rainbow chard. It had a really earthy, wholesome taste that was just right for a crisp autumn night. Finally, we tried the Mafe sauce, a peanut based sauce, which worryingly, has the note ‘may contain traces of peanuts’! I think this has far more than a trace. 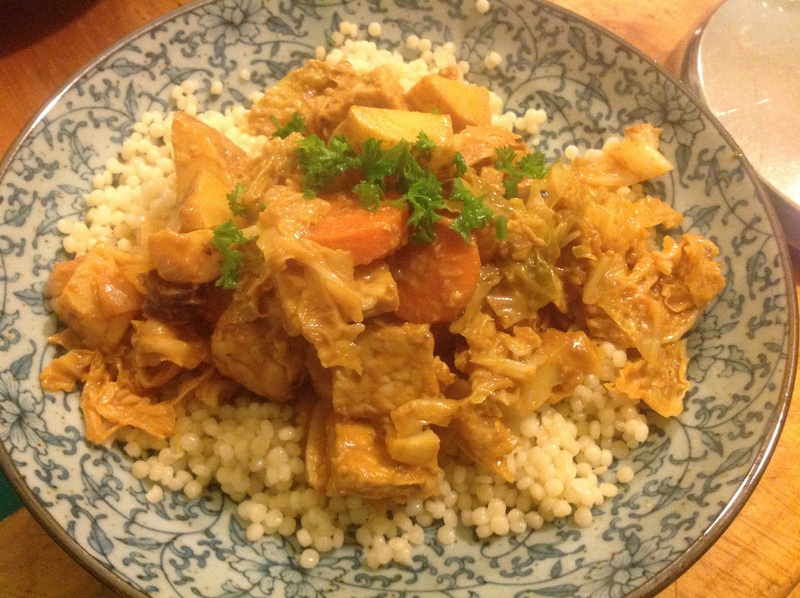 I followed the suggested recipe, using tempeh instead of meat (thanks Abby for picking up my typo – now fixed!) along with potatoes, cabbage, onion and carrots. I served it with pearl couscous. It was a great combination with the nutty creaminess of the sauce. We ate the first two dinners in the two days following the farmers’ market, so I thought I’d hold out to try to third. I made it till today, which shows great willpower, because they were all delicious! I’m going to stock up next month – and there are so many more to try. I can’t wait! There were a lot more products available from this stall. In fact, I saw a chai powder that we bought last year. We sometimes add it to hot chocolate, for an extra dash of deliciousness. Find out more about Juanita’s Kitchen. Where are the dosa guys? Find out more about Bundoora Farmers Market. Just to get your taste buds going, check out this video of how to make traditional black mole (sorry about the lard and chicken stock – you don’t have to worry about them with Juanita’s mole, it’s all vegan). They’re something a bit different, and it’s so nice to have a convenience food that tastes good and isn’t full of horrible additives. Everything in this post has made me extremely hungry, although you did make my eyes pop with the “meat instead of tempeh,” but I’m picking up what you’re putting down. Surely, you’re in a simmer sauce dream-state. Yuk, yuk, yuk! Ughhh! That certainly woke me from my simmer sauce dream-state! Thanks for picking that up. They do say you should never proofread your own writing – and this is proof of that. So you did! I must have missed that post (I have feed reader disorganisation problems!) Those burgers look really good. It’s a pity about the Pentridge market closing. It looks like it would have been a great place for a market. We only ever seem to go to the Bundoora Market (even though it’s not all that close to us – and there are farmers’ markets in Fairfield and Thornbury that we keep saying we’ll get to!). This weekend is Bundoora’s weekend again, so I’ll be stocking up again…and I might give those burgers a try. I love seeing “VEGAN” everywhere I go! These African and Mexican simmer sauces are something I would love to try! I think I would like to try the peanut-based sauce, Mafe, it looks pretty tasty with the tempeh and veggies!